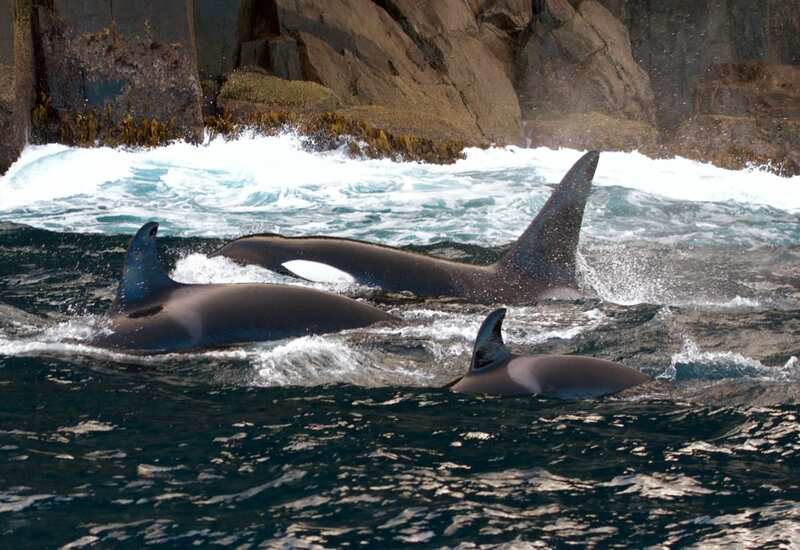 A family pod of Orcas travelling along Tasmania’s coastline. The 1st of August gave us the great opportunity to track and study a slow travelling family pod of Orcas on our coastline. 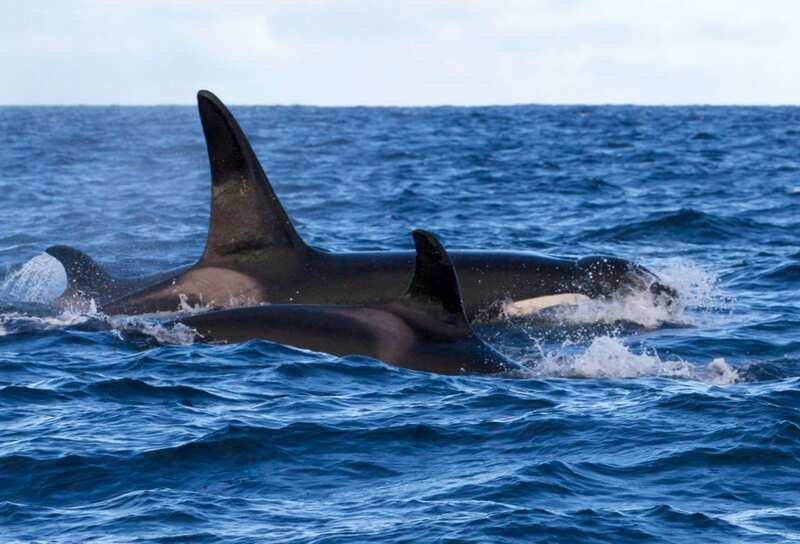 Five Killer Whales had been sighted the day before off Schouten Island which is located about 47nm (87km) further up the coast. We were notified that the animals were slowly moving South, indicating a good chance to go ahead with some research work. Wild Ocean Tasmania provides the research vessel for PhD student Ben Sellers from the Institute of Marine and Antarctic Studies (IMAS). 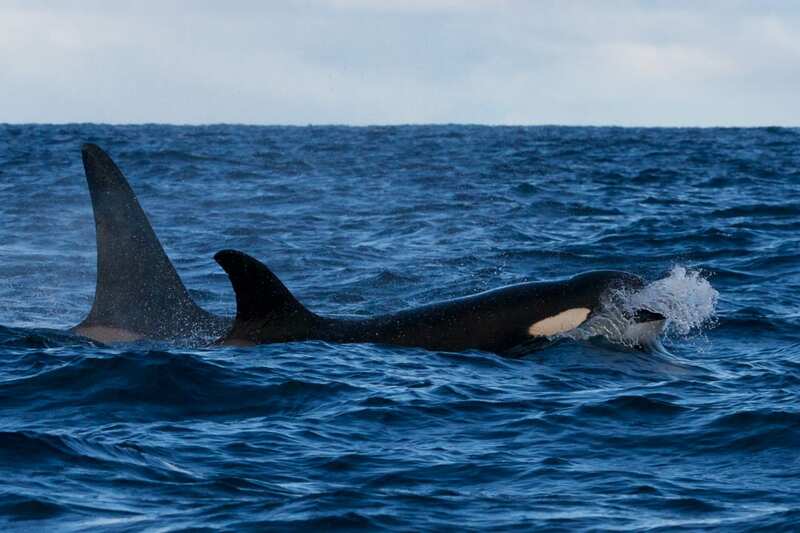 Ben’s aim is to find out more about the dietary habits of Killer Whales in Australian waters. 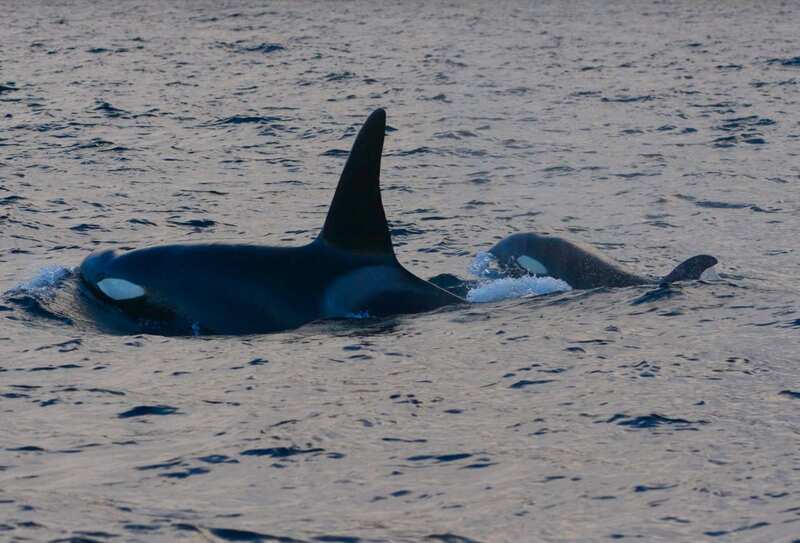 Scientists have a fair idea what types of prey the Killer Whales target thanks to sightings of researchers, tour operators and citizen science. Prey items include Seals, Rays, Tuna, Penguins, Squid and even Whale calves. However, more research has to be done to confirm the dietary choices of Killer Whales on a regular basis. Tracking Killer Whales for research purposes. Tissue samples can be used to examine the feeding habit of an individual animal. By looking at the fatty acid composition of the Killer Whale’s fat and comparing it to its potential prey, scientists can make some conclusions about what that individual has eaten over the last few months. This process presents more in depth information than we would be able to gather relying on sightings only. Ben Sellers uses a modern biopsy method that allows him to take tissue samples with specially designed darts. Strict regulations and permits are in place to ensure the animals welfare. One of the rules prohibits using this technique when calves are sighted in the pod. For our Orca encounter on Tuesday, it meant that no biopsy samples were going to be taken, as we spotted a young animal, approximately 4 years of age. A mature male Killer Whale with the young one. Orcas are listed as ‘data deficient’ on the IUCN red list of threatened species. There is not enough information available to issue a conservation status for these animals. So even though no biopsy samples were taken, the encounter with the three Orcas on Tuesday afternoon presented a great chance to collect valuable data material to help with the identification and behavioural studies. 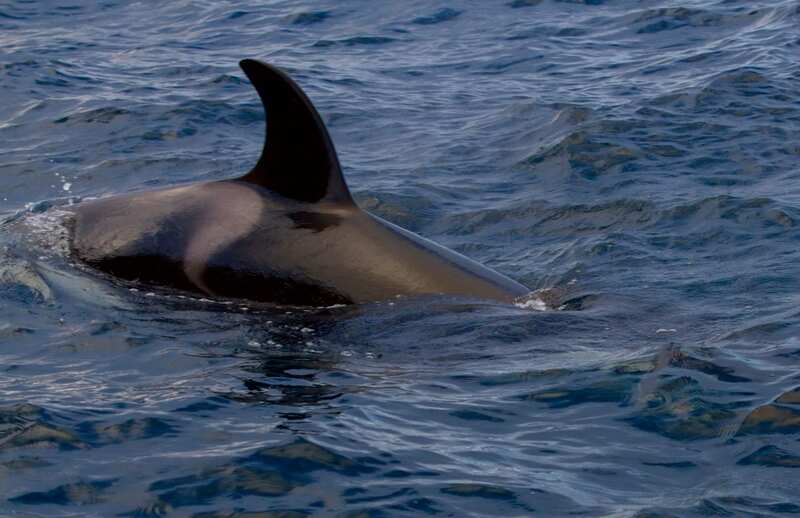 The identification of individual Killer Whales is vital to expand the ID catalogue – managed by David Donnelly from Killer Whales Australia – and to feed the database with more information in regard to the population size, distribution, life history and ecology and possible threats to this species. The primary form of identification are high quality photos of the dorsal fin from both sides. The dorsal fin of each animal has a unique shape as well as distinct nicks, scarring and notches and usually yield sufficient information to assign an image to an individual Killer whale. Orcas can be identified by the their individual scars, nicks and notches on their dorsal fin. The secondary feature used for the identification of individual Killer Whales is the saddle patch right behind and below the dorsal fin. The shape, contrast and scarring of the saddle patch is unique to each animal and is usually used in conjunction with the dorsal fin as an identifying feature. 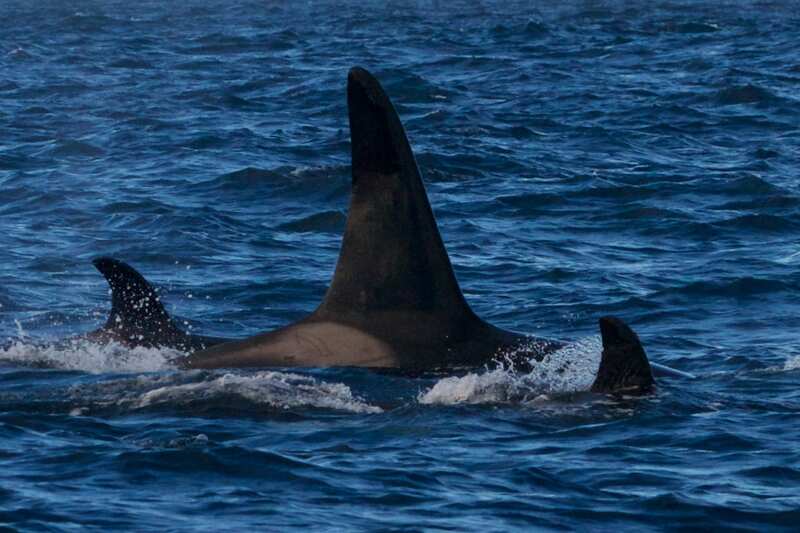 Another distinct feature of individual Orcas is the saddle patch just behind the dorsal fin. When images of the dorsal fin and saddle patch are at a poor angle for the use in stand-alone identification, the eye patch can be a useful third option for the individual identification of Killer Whales. One means of the identification of Orcas is to look at their eye patches. 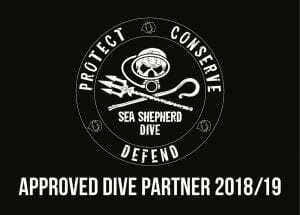 We’ve sent our best ID photos for identification purposes off to David Donnelly from Killer Whales Australia and got informed that the same animals have been sighted off Phillip Island in 2013, indicating that the young one must be 4+ years old. None of these animals have yet been listed in the ID catalogue featuring about 60 individuals. The catalogue is a work in progress. Using robust methods, David and his team from KWA assess each image for its useability for identification. All images assigned to an individual killer whale have to be verified by at least two additional independent observers. If all three observers agree on an individual, that animal is then given a unique identification number and added to the catalogue. When tracking the Orcas, we also had the opportunity to film the youngest one underwater and record some rare acoustics of the animals. The footage shows the little one swim towards our vessel and then pass it to follow it’s mother. The audio recording is currently being analysed. Researchers suggest it might be the mother calling it’s young to come closer. Watch the video and listen to the beautiful vocals at the end of the clip! If you would like to join one of our wildlife tours, learn about Tasmania’s diverse marine life and help with Ocean conservation, check out our half-day Seal & Ocean Expedition, 2-hour Coastal Adventure or book a private charter for your group! We can’t wait to share this beautiful place with you! Previous PostJune special: 5% off all cruisesNext PostResponsible whale-watching rocks!